« I learned, a new definition for a term, that I might, maybe, use sometime. The watercolor featured in the Register article was that of the Pocahontas, Iowa, grain elevator, shown at the left. The article caught the attention of Arlene Brockney of Waukee who lived in Pocahontas in the late 1940s and is the daughter of Viola Jacobson. Arlene’s recollection of the grain elevator construction is as follows. My family lived west across the street while it [the grain elevator] was being built. They worked all day and night pouring the cement. For the workers there was a huge night-light that was also great for evening walks. My mom went to work at the Ideal Cafe at 5 o’clock in the morning. As she would leave the house for work, the construction crew would holler down to her their orders for breakfast. That way, hot food was ready for them when their shift was done. When the elevator was finished, my mother and two sisters rode to the top and waved at me. 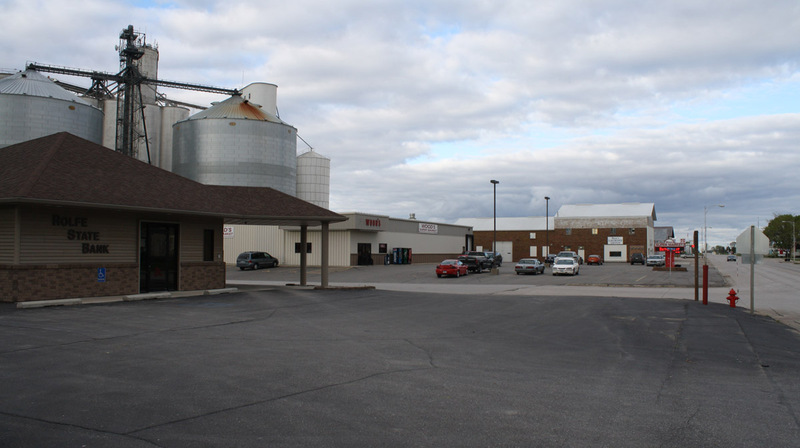 Our lot is now in the approximate area of the parking lot for the branch office of the Rolfe State Bank. Arlene said she was 14-years-old and detasseled corn that summer of 1949. She said that the night-light for the construction crew was like a helicopter hovering. Arlene chuckled when she said that the light did not allow for privacy, making her glad that the elevator construction was completed by the time she started dating! In the midst of the breeze of the summer nights, while on the ground, Arlene could hear the construction workers above talking. Well, actually mumbling with people below not knowing exactly what the workers were talking about. At that time, Arlene’s family lived in a trailer on the Pocahontas property that is now owned by Rolfe State Bank. At this link you’ll see information regarding prints of Mother’s watercolor (shown above) as well as where you may purchase them in Rolfe. Prints may also be ordered online. Mother also painted the Rolfe grain elevator and train depot (two watercolors) and Gilmore City grain elevator and depot (one watercolor). *All profits go to support the digitizing of 101 years of Rolfe newspapers so they will be accessible online. Hopefully they will be online in March. 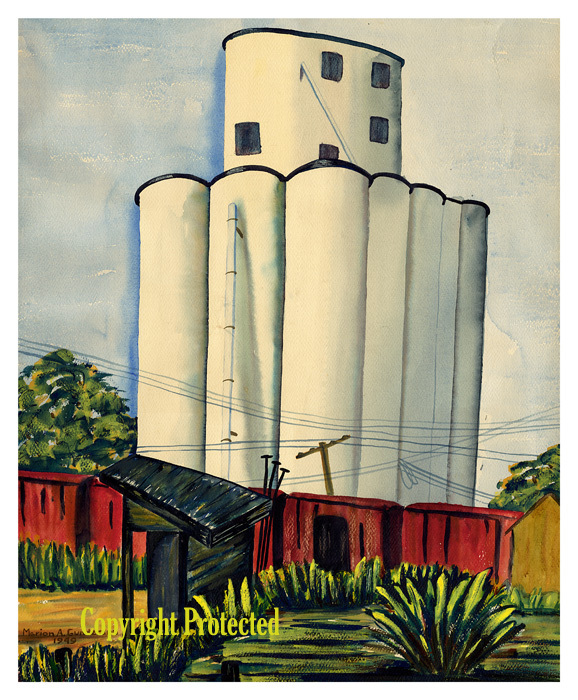 This entry was posted on January 20, 2011 at 9:03 am and is filed under Grain Elevator, Iowa, Pocahontas, Pocahontas Grain Elevator II, Watercolor image. You can follow any responses to this entry through the RSS 2.0 feed. You can skip to the end and leave a response. Pinging is currently not allowed. What a treasure trove of facts and memories and feelings. Thank you, Arlene! And to you, too, Louise, for making it all so accessible to us! Very nice post – and I love the painting! I remember going with Mother once when she painted the Pocahontas elevator. Although we probably were with other members of the Barr Art Association, I don’t remember if they were there or it was just Mother. Nor do I recall how old I would have been, but if it was this painting, I was probably seven. One thing that we didn’t discover until recently is that sometimes Mother created more than one painting of the same thing. We think it’s the same, but when we look closely we discover differences. That’s true with this elevator painting. We don’t know if Mother was so intrigued with the painting that she did another, if she was trying to correct a flaw (she always thought of something that could be improved), or if she was creating another painting for someone else. Clara: What fun to read about you being on location with Mother when you were little AND that you were probably there with other Barr Art members. I remember you saying something once about Mother and the other painters using the tin cans for the water used for the watercolors. I’m so glad to know of someone who was actually there. Jerry: Yes, Bill is the “other half.” He graduated from Rolfe in ’71. I graduated from Rolfe in ’73. He is the second son of John and Bonnie. Thank you for your kind comments about my sharing the art and some of the other posts. Yes, all is well…and thank YOU for reading and commenting. Searching for Ideal Cafe and found this post. My Grandmother Lyle Wilbur owned the Cafe at this time. I recognized the grain elevator right away. Love the painting.